Jurisdiction in Deleuze: The Expression and Representation of Law explores an affinity between the philosophy of Gilles Deleuze and jurisprudence as a tradition of technical legal thought. The author addresses and reopens a central aesthetic problem in jurisprudence: the difference between the expression and the representation of law. Deleuze is taken as offering not just an important methodological recovery of an ‘expressionism’ in philosophy – specifically through Nietzsche and Spinoza – but also a surprisingly practical jurisprudence which recasts the major technical terms of jurisdiction (persons, things and actions) in terms of their distinctively expressive or performative modalities. In paying attention to law’s expression, Deleuze is thus shown to offer an account of how meaning may attach to the instrument and medium of law and how legal desire may be registered within the texture and technology of jurisdiction. Contributing both to a renewed transposition of Deleuze into contemporary legal theory, as well as to an emerging interest in law’s technology, institution and instrumentality in critical legal studies, Jurisdiction in Deleuze will be of considerable interest. 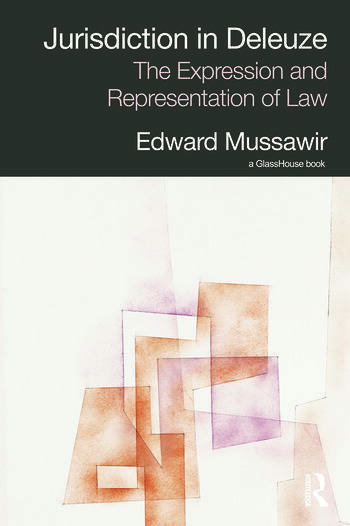 Edward Mussawir is based in the Department of Law at the University of Melbourne, Australia.